Zucchini never tasted so good, especially paired with exotic mushrooms. The trick is to slice the zucchini very thin and not overcook it. Enjoy on any of the Key Diets. 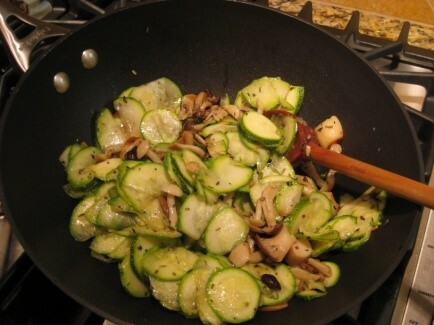 Wash the zucchini and mushrooms. 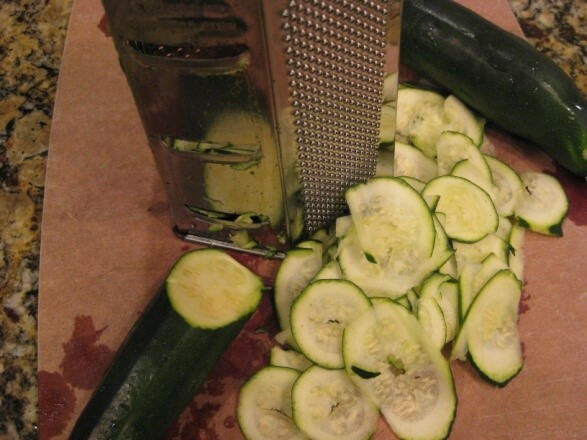 Using a cheese grater on the slicer side (see picture above), slice the zucchini. Cut the tips off the mushroom ends, and chop them any way you like. Using a non-stick wok-style or saute pan over high heat, add 1 T. of olive oil and the mushrooms. Saute until mushrooms soften, about 3 minutes. Increase the heat, add the wine, stir and let cook until the liquid almost disappears, about 3 minutes. Add the zucchini, Meritage seasoning, remaining olive oil, and continue stirring for one minute. Take pan off the heat and immediately transfer the vegetables to a serving bowl. You can sprinkle some freshly grated parmesan cheese over the top if desired. Add a dash of salt and pepper and serve warm. Nutritional Analysis: Each serving contains approximately 2 grams of protein, 5 grams of net carbohydrate, 7 grams of fat and 90 net calories.